Following on from the success of its first photographic exhibition at No.8 Dover Street, Aston Martin is pleased to announce that ‘NEON ICONS’ by Louis Sidoli will open in London on 09 November 2017. ‘NEON ICONS’ is a brand new body of work from Louis Sidoli, famed for his artistic exploration of popular culture, highlighted by his use of aluminium and neon. Every item in his collection is crafted by hand at his studio just five miles from the Aston Martin Headquarters in Gaydon, from the solid oak frame to the neon glass, with meticulous attention to detail. The first ever viewing of this collection will run for three months at Aston Martin’s brand experience centre at No.8 Dover Street in London’s Mayfair. 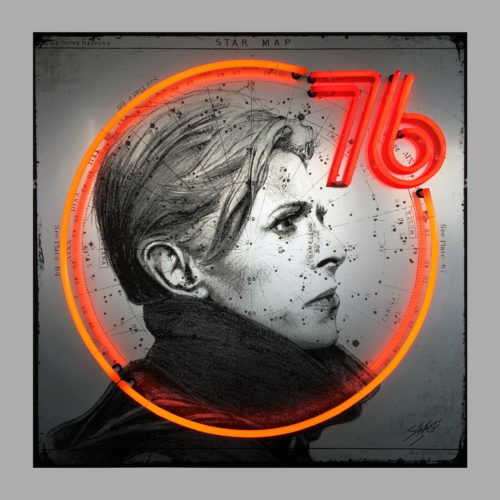 The highlight of ‘NEON ICONS’ is a truly stunning piece of art based on a photograph of David Bowie, taken by the world-famous photographer Terry O’Neill. The collaboration between Sidoli and O’Neill has produced an iconic piece which, alongside five other original pieces featuring Mick Jagger, Marilyn Monroe and Elvis Presley, forms the centrepiece of a not-to-be-missed exhibition at Aston Martin’s cultural hub. Sidoli’s affinity for high quality materials, engineering and craftsmanship stems from his 15-year career as a designer in the car industry. He applies the same work ethic to his works of pop art that a car designer does to make sure every detail is perfect. Since the launch of his first collection in 2007, Sidoli’s work has featured in over 50 solo and group exhibitions and is owned by collectors across the globe, including high profile personalities such as Liam Gallagher, Ozzy Osbourne, and Gary Neville to name a few. ‘NEON ICONS’ by Louis Sidoli opens at No.8 Dover Street, London on 09 November 2017 and runs for three months. Original works will be available for sale.